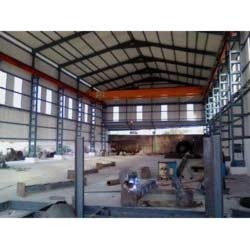 We are an eminent organization engaged in manufacturing and supplying Industrial Shed. Under the offered range, we have Shed Steel Structure, Prefabricated Shed, Heavy Fabricated Structures and Ware House Shed. The demand of offered factory sheds is at peak as these are made using high grade raw material in conformation with universally accepted quality standards. After the completion of the production process, we make these factory sheds pass a quality check so as to ensure their peerless standards. We are widely recognized as one of the prominent manufacturers and suppliers of Prefabricated Shed. Offered prefabricated sheds are able to meet the expectations of patrons as these are manufactured under the supervision of professionals by using best quality raw material. Our professionals ensure that these prefabricated sheds are made in-compliance with the established quality standards of the industry. with more experience in PEB (Pre-Engineering Building) System, We supply Heay PEB Shed Structure As Per Coustomer Requirement. with the suitable Price Range.this PEB Warehouse Have Huge Demand in the industrial market due to their high quility with long lasting durability,reliability, with easy to reassamble in other Industrial Premises. We are a quality focused organization engaged in manufacturing and supplying Workshop Shed. Offered workshop sheds are made at our sound manufacturing unit by making use of the best grade raw material and modern machinery. Our quality controllers monitor the entire manufacturing process of these workshop sheds so as to ensure their synchronization with the universally accepted quality standards.